Zucchini is one type of summer squash, which means it grows the most vigorously and produces the largest yields of fruit in warm temperatures. Zucchini is grown throughout the United States during times of no frost. There are several types of zucchini plants available to the home gardener, from rambling vines to more compact bush varieties. However, the care requirements remain the same. Zucchini needs minimal maintenance and will produce fruit about 60 days after planting. Plant zucchini after all danger of frost has passed in an area that receives full sun and has well-drained soil. Sow seeds in rows about 1/2 inch deep and 24 to 36 inches apart. Allow 2 to 3 feet of space on each side of the rows for the vines to grow. You may also plant “hills,” or groups of five to six seeds sown together. Space hills about 5 feet apart. Water zucchini plants immediately after planting, and then at least once per week during the spring and summer any time the rainfall is less than 1 inch for that week. Soak the soil thoroughly. Water twice per week for sandy soils, as they retain less moisture than heavier soils. Apply a nitrogen fertilizer to zucchini plants during mid-summer. Use 1/2 cup of 46-0-0 NPK or 1 cup of 27-3-3 NPK for each 25 feet of plants. Refer to the manufacturer's instructions for proper dosage and application directions. Make sure the fertilizer is approved for use on vegetable plants before applying. Apply a thin layer of mulch around the base of zucchini plants once the first five leaves appear on the seedlings. Use straw mulch or hay for the best results, as these materials will help conserve moisture and prevent weeds from growing around the zucchini. Harvest zucchini when they reach 6 to 8 inches long and about 2 inches in diameter. Zucchini will be ready to harvest approximately four to eight days after flowering, but it's more important to judge the size of the vegetables. Larger zucchini will be hard, seedy and watery. Harvest any zucchini that meet the size requirement every other day to keep the plant producing fruit as long as possible. 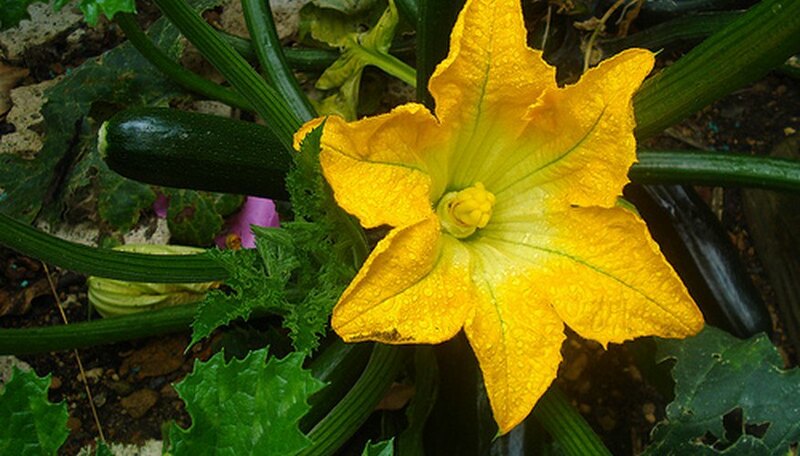 Incorporate organic compost into the soil prior to planting zucchini to increase fertility. If you've used enough organic material at planting time, fertilizing may be unnecessary. Contact your county extension office for a soil test to help determine which nutrients your zucchini plants need.